Is there a better alternative to PDFOptim? Is PDFOptim really the best app in Compression category? Will PDFOptim work good on macOS 10.13.4? 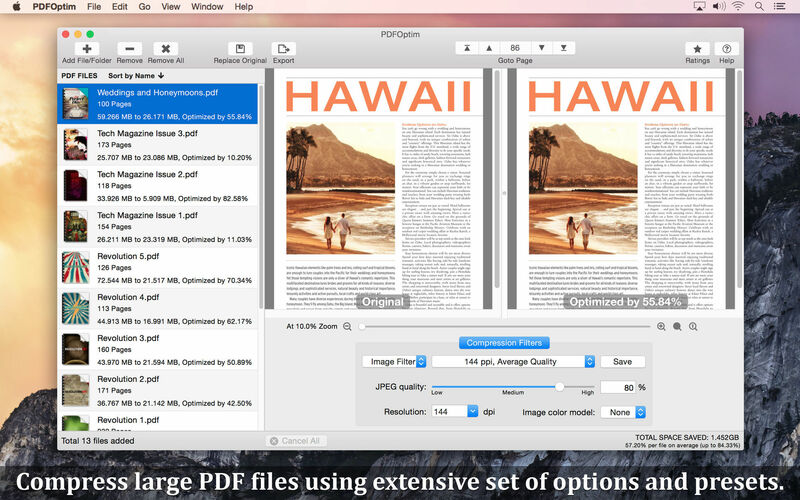 PDFOptim is a simple and intuitive way to compress, reduce, and optimize PDF file size. It provides easy and effective ways to compress large, image-heavy PDF files using an extensive set of options and presets. Supports batch processing and provides real-time original as well as optimized PDF document preview for side-by-side quality comparison. PDFOptim needs a rating. Be the first to rate this app and get the discussion started! Compressed PDF documents requires less disk space for storage, and faster uploads and downloads save transmission time and cost. PDFOptim has compression-filter options to help you to reduce PDF file size without compromising the document's integrity, rewriting the entire PDF document as efficiently as possible. Some PDF documents might not get compressed, because they may be already compressed or have little to compress. Batch compression of PDF documents as you add into list. JPEG compression with quality control. Color-model conversion for all color data of all PDF objects using RGB, CMYK, and grayscale color profiles. Image sampling with quality, downsampling at lower resolution decreases the file size dramatically. Real-time preview of the original and optimized PDFs. It helps you to compare optimized-PDF integrity and quality side-by-side. Synchronized zooming controls (slider, zoom-in, zoom-out, actual-size, and zoom-to-fit buttons) for both previews. Trackpad gestures are also supported. Default set of compression filters. Save and preserve your favorite customized compression filter as new preset. Drag-and-drop selected compressed PDF files from the list into other applications like Finder, Mail, Preview, etc. Very flexible options to add PDF files for compression. Simply drag-and-drop them into the PDF list, right-click and choose Open With... in Finder, or drop on "PDFOptim" application to add PDF files beside direct Add File/Folder buttons. PDF page-navigation controls, right-click contextual menu on preview to enhances the PDFOptim usability.